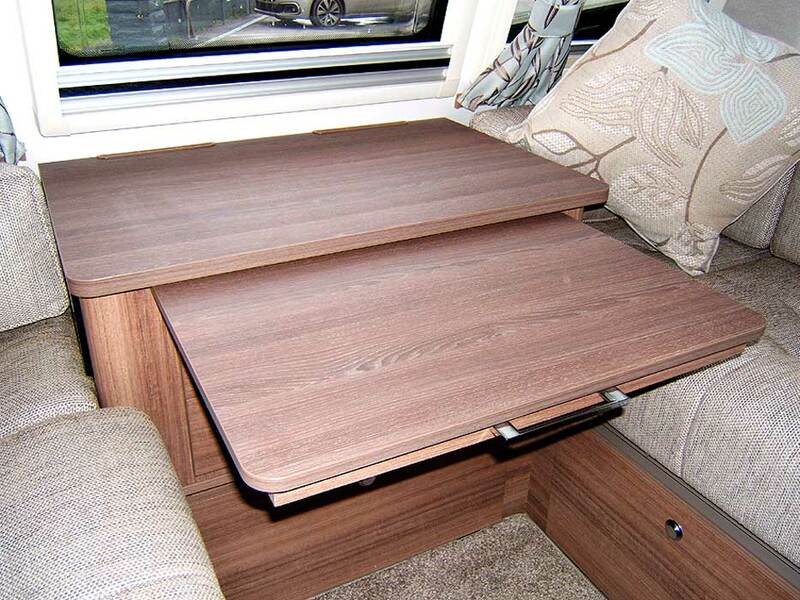 A single axle, 4 berth caravan with the convenience of a dinette area for meal-times. Both the interior and exterior are in very nice condition. Seating - the seating actually projects beyond the 2 drawer cabinet ( see photographs ) but from the end of the seat up to the cabinet is 1.37 metres on both sides. The actual seats are 1.76 metres long in total. Seating is comfortable and in a good condition. Night-Time Lighting - The front lounge has 4 directional spotlights that are positioned into the four corners. Each light has it's own switch and therefore you can choose which ones you want to have on. In addition to these there is a wide strip light situated on the ceiling that has a diffuser face-plate. Daylight - as you will see from the photographs, you will not struggle to have enough daylight in the lounge. Daylight comes into the lounge area via the surrounding windows, the skylight and the rooflight above. Storage - The lounge has 4 overhead lockers. The cabinet between the seats provides 2 drawers and a cupboard space beneath. The storage space beneath the seats can be accessed either by using the front facing doors which give very good and convenient access or by removing the seat cushions and lifting the slatted wood frame ( this gives full access ). Using As A Sleeping Area - The front lounge has an Easy Bed Make-Up System. This is an array of wooden slats that pulls out and runs on a glide-track ( see photographs ). 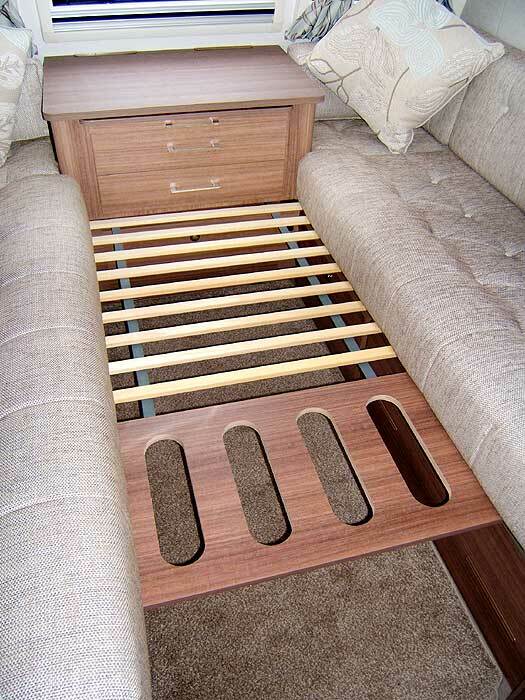 It makes the process of changing the lounge into a sleeping area easier and less tiresome. To cut out light, all rooflights and windows have integral pleated blinds. You can make the area into a double bed; 6' 8" x 5' 11" or two single beds : 1 @ 5' 11" x 2' 4" and 1 @ 6' 3" x 2' 4"
Entertainment - There is a JVC KDR223 Radio / CD player for entertainment and enjoyment. This is linked to a Vision Plus VP2 signal booster and is situated out-of-sight in one of the overhead lockers. Other - on the top of the 2 drawer cabinet is an easy to use pull-out / push back occasional table that is very handy for newspapers, occasional mugs of tea or coffee and any magazines you are relaxing to. Situated directly between the lounge and kitchen area. This means that the TV can be watched either from the lounge or from the dinette. There is the usual TV connection point plus both mains and 12 volt power sockets. There is a cupboard for storage both above and below the connection points. 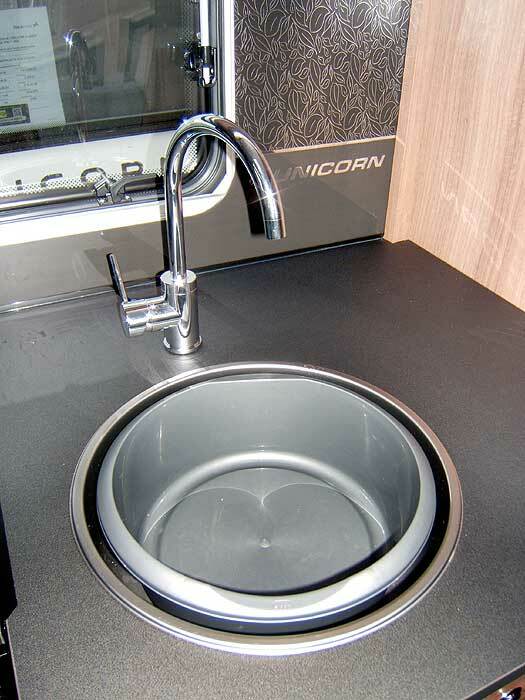 The Kitchen area is situated centrally in the caravan and in the perfect position for serving meals to the dining area. The kitchen has a useful amount of worktop available for preparing meals etc. Storage - The kitchen has 3 standard sized cupboards above the worktop ( with the microwave sandwiched between them ). Beneath the worktop are 2 good sized drawers, one of which has a cutlery tray in it. 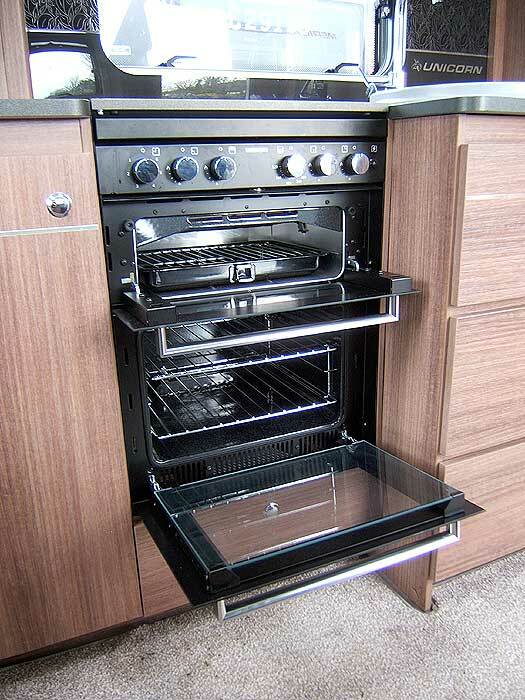 In addition to these there is more storage between the oven and fridge and the usual cupboard for storing baking trays and similar items beneath the oven itself. Daylight - plenty of daylight comes into the kitchen area. There is a window behind the sink but there is also a window on the opposite side by the dining area. The roof vent in the ceiling also provides some daylight whilst also helping to reduce condensation from cooking. Night-Time Lighting - To provide light at night or in low light conditions there is a thin striplight over the hob and sink. Cooker - Thetford thermostatic oven and separate grill. Hob - Dual fuel hob with 800w electric hotplate and 3 gas burners. Electronic ignition. Refrigerator - The kitchen is fitted with a Thetford 113 litre fridge with freezer top box and electronic ignition. Microwave - A Sanyo microwave is provided. Sensibly positioned directly opposite the kitchen area, the dinette provides convenience at meal times as well as a sleeping area at night. 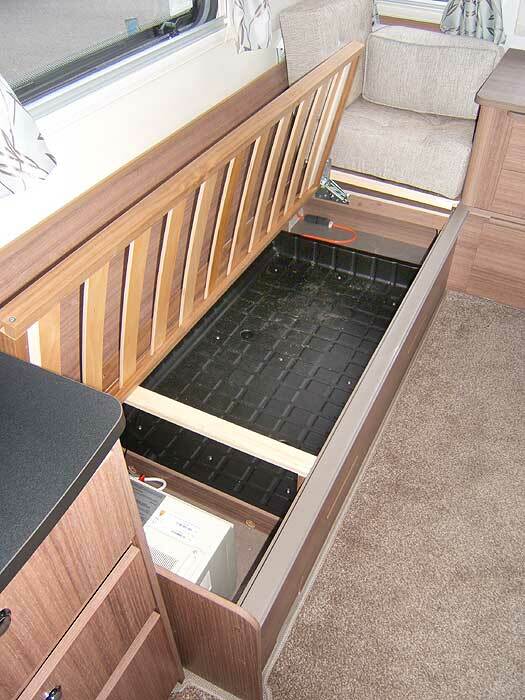 There is a curtain that runs on a ceiling mounted rail to separate this area from the rest of the caravan at night. Storage - The dining area has 3 overhead lockers and also storage space beneath each seat. Daylight - a side window provides daylight directly to this area whilst many other light sources contribute as well. Night-Time Lighting - 2 directional spotlights provide light at night or in low light conditions. 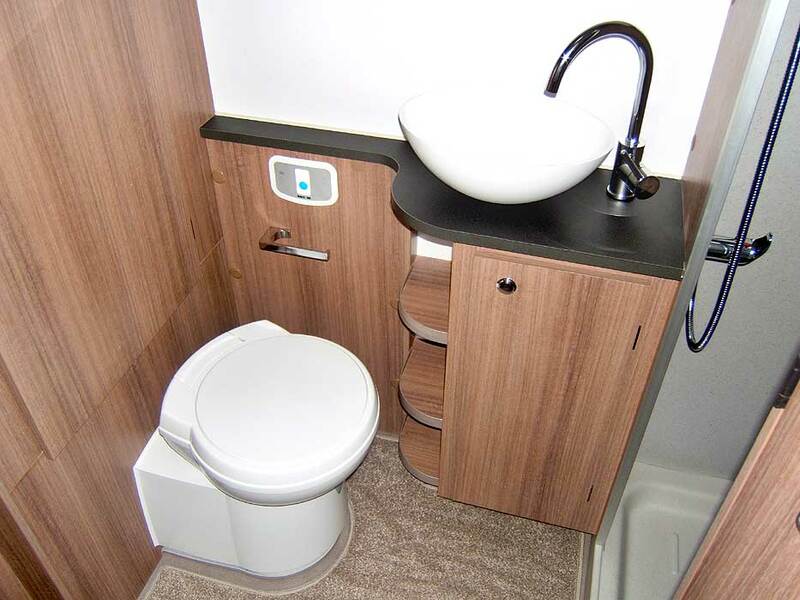 The Washroom is situated at the rear of the caravan. To reduce condensation build up, there is a vent in the ceiling which also brings in some daylight. There is also a fixed spotlight in the shower cubicle which has a bi-fold access door and integral shelves. The shower cubicle measures 83 x 60cm approximately. Above the washbasin is a wall mounted mirror. Daylight - a window provides daylight directly plus some daylight is provided by the ceiling vent. Night-Time Lighting - There is a main ceiling light to provide light generally. There is also a fixed spotlight by the washbasin. TV Signal - fitted with a Vision Plus signal booster and a Vision Plus Status 550 directional television aerial. Heating - Blown air ducted to living room, sleeping and washroom areas. 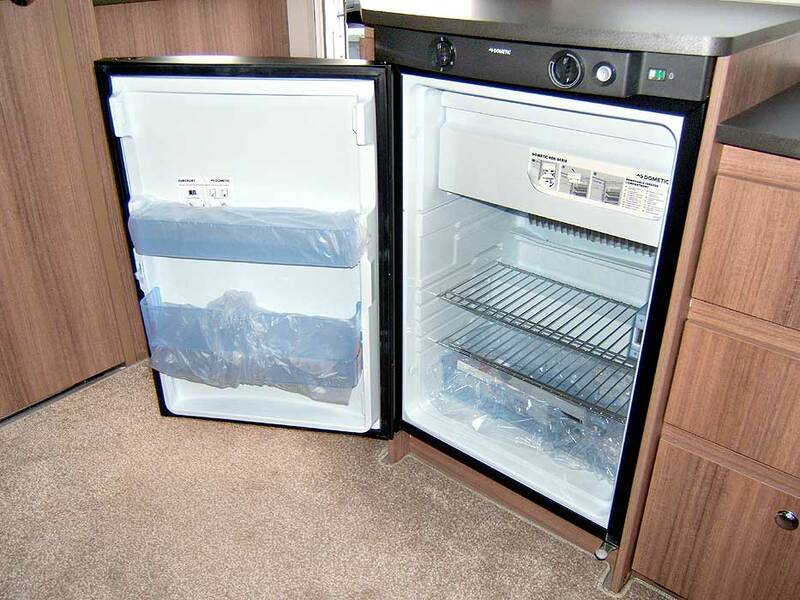 Refrigerator - Thetford 113 litre fridge with freezer top box and electronic ignition. Cooking - Thetford thermostatic oven and separate grill. Dual fuel hob with 800w electric hotplate and 3 gas burners Electronic ignition. Microwave oven. Radio / CD Player - JVC KDR223 stereo CD and FM radio connected to stereo speakers for superior sound quality. Cassette Toilet - Thetford C260 cassette toilet with electric flush. 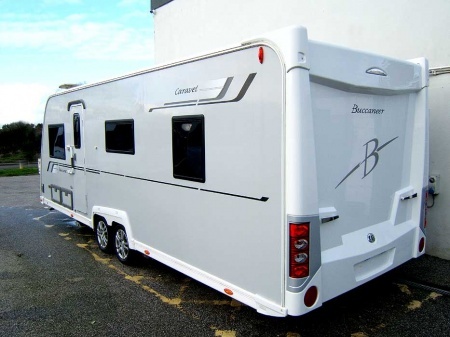 Please Note: Due to the considerable changes to and sheer volume of makes and models of caravans AND the difficulty of obtaining historical information, it cannot be guaranteed that the details given here are correct. Thus they are given AS A GUIDE ONLY and should be treated and understood as such. 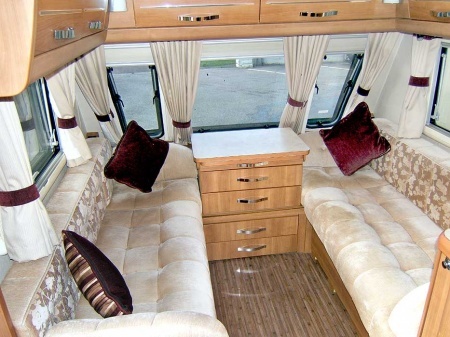 Unless otherwise stated, the Penrose Touring price includes 12 months warranty provided by MB&G Insurance. At the time of purchase you are provided with a booklet produced by MB&G Insurance. The booklet explains what the warranty does and does not cover, what additional benefits you may be entitled to, the insurance conditions and how to make a claim under the warranty. The booklet also includes a claim form for your convenience. MB&G - Who Are They? Dealing with a Caravan warranty claim can be a very complex situation, which is why you’ll be glad of our knowledge and expertise. We understand the difficulties and can point out the potential pitfalls, and we also work with the manufacturers too. We can even cover that old devil, water ingress – a common problem that doesn’t always have a common solution – for up to seven years. Put simply, you can rely on us whatever the weather. The warranty contract will be between yourselves and MB&G Insurance. If you need to make a warranty claim then you contact MB&G Insurance direct. We have collected a couple of quotes from people who have made warranty claims with MB&G Insurance which we feel will be helpful. I had a 36 months gold package with them and made a claim for a repair in France. They paid 80% of the bill which was over 1100 euro. I have had very good experiences with this company 3 years ago. Firstly,the power steering rack failed.One phone call to MB&G. I was asked where I would like to have it done,which was our local garage in Gretna.They then contacted the gararage.All I had to do was to sit and wait a few days until it was done.Brilliant! Next was the kitchen tap which went in France--quick phone call to MB&G--kept receipt and was re-imbursed within 4 days of being back home. The integral bike rack hinges failed. It was repaired by Peter Hambilton, who did a brilliant job. Again,just a quick phone call to MB&G,and everything was sorted. I would only hope they are still as good now as they were then. I couldn't fault them. The warranty was in with the price of the van,so I can't say how much it cost but as the van was 10 yrs old I wanted some form of assurance for that 1st year. Incidentally,it's needed nothing since, other than basic service items. You can only speak as you find,but for me they were very good. The type/level of warranty applicable is dependent on the age of the caravan. The information provided here is not exhaustive; it is not possible to state what is included and what is specifically excluded by the warranty cover you will receive. 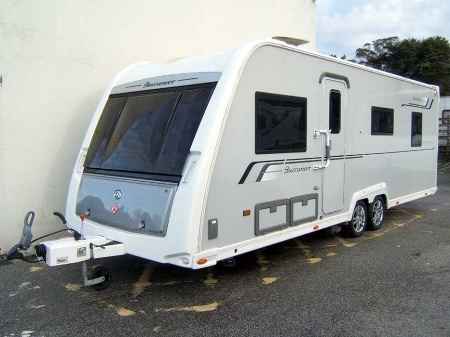 If you require this information then you need to check your policy or request the information before purchasing the caravan.